So I'm a girly girl. I love all things pink. I love flowers, puppies and ROMANCE books. What do I not love? 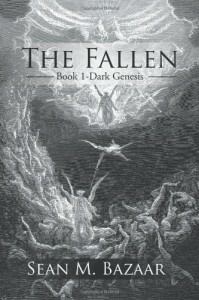 Sci-FI/Fantasy, blood and gore, cliffhangers and books without a Happy Ever After. Why on earth did I read this then, I hear you ask! Well, I was set a challenge by the author to step out of my comfort zone and try something completely different. "Challenge Accepted" I said! What did I not expect to happen? That I would absolutely love it, so much so, in fact, that I stayed up until the early hours so I could finish it!!! WTF??? I know, right?? Everyone knows the story of Armageddon, yes? The battle between good and evil, Angels and Demons, Heaven and Hell. Bazaar has taken a well known story and put his own spin on it; and he has done it in style! If you're looking for a book where good triumphs over evil....it aint this one! He doesn't ease you into the story gently. From page one its full-on, fast-paced and very addictive. The descriptions are so vivid and I was made to feel like I was in the story with ring-side seats watching Commander Krillion and his army fight the demons. "One of her wings bones snapped with a horrible sound that echoed through the vast room. Tears streamed down the Angels face, and she convulsed in the throes of unimaginable pain. Still the demons pulled." Yikes!! The author certainly has a way with words!! There is blood and guts aplenty, masses of emotion, a hint of humour and for us girlies, there was the beginnings of a love story or two! Oh! And my favourite, the badass female angels Raziel, Zara and Cassiel. I loved the way the story was told from alternate points of view, plus we also get to read journal entries from a young human girl called Alisha, and as the story continues we come to understand exactly what part she plays in the overall story. "The Seraphim had been betrayed by one of their own. This was by far the most crushing blow the Seraphim had endured in the war." The story kicks up a notch after this event and I struggled to keep my heart rate at an even pace! I still find it hard to believe that this is Bazaars first novel, he certainly has done an amazing job. I just hope that we arent left waiting too long for Book 2. Did I really just say that??? Believe it or not, I did. I"ve been converted and I really look forward to reading whatever the author comes up with next. Without a doubt I would highly recommend you read this - you wont be disappointed.